Miter saws are saws used to make cuts at a number of angles. With miter saws, you can make crosscuts, miter cuts, and bevel cuts. Miter cuts are angled cuts along the width of the board you are cutting. Miter cuts are made by rotating the saw to the angle that you want. To achieve this perfectly rotated angle, your miter saw needs to be firmly positioned on a stand that keeps it locked down. 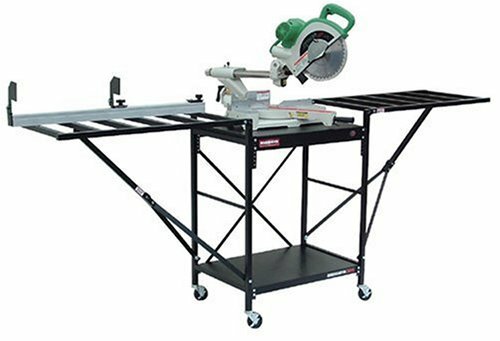 A miter saw stand is one that should be properly balanced, solid enough to keep the miter saw in a stationary position, and easy to be used. The angle and quality of the cuts you make may well depend on the type of stand that your miter saw is positioned on. It is therefore important that you purchase a rolling miter saw stand that will not compromise the overall quality of your work. This review is a review of the top ten rolling miter saw stands. It will help you select the best rolling miter saw stand that you can use in your workshop. 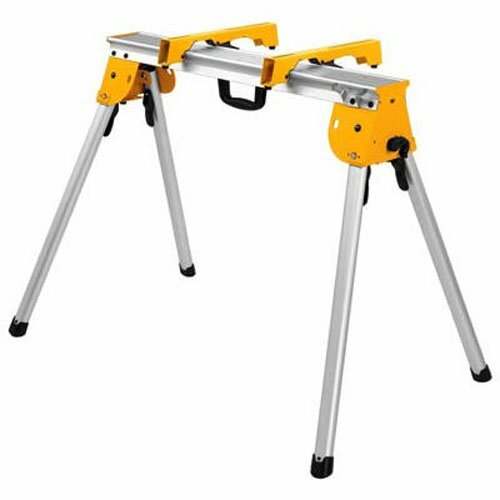 This rolling miter saw stand from Dewalt is constructed with high-quality steel and has a 300-pound weight carrying limit. It is easy to move around and easy to pack into storage because of its wide wheels made of rubber and the vertically foldable design. It can accommodate and support any miter saws of any height and dimensions because it has mounting rails that can easily be adjusted to fit. It is able to give about 8 inches of support for material because the out-feed and in-feed supports are wide and can be adjusted too. For all your miter cuts, bevel cuts and cross cuts, this stand provides your miter saw with all the support and foundation that it needs. Some users have however reported that this stand tips over when used on even the slightest uneven ground with the saw going down head-first. So be sure to only use this stand on even and level ground. 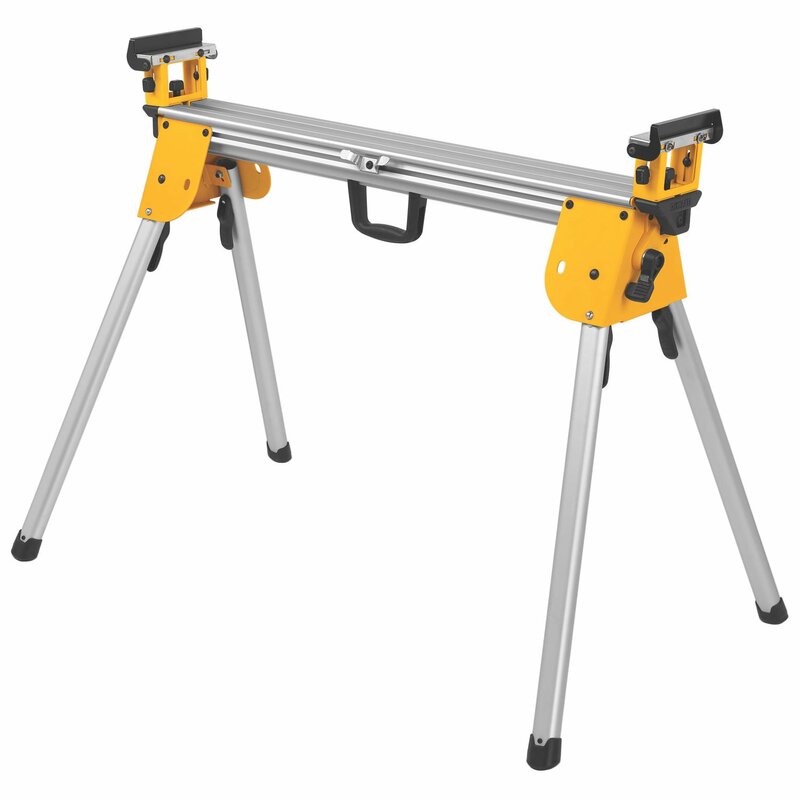 This is another rolling miter saw stand from Dewalt. Weighing in at only 35 pounds, it is lightweight and constructed with aluminum. It offers you hassle-free transport from and to your job site. The design of this miter saw stand is comprehensive and will work with any and every make of miter saw. It comes fitted with mounting brackets that make mounting your miter saw on it easy. The mounting brackets also keep your miter saw safely anchored on this stand, thereby keeping you safe and protected as you work. The beam is five and a half inches and can reach to give support to the material of up to 16 feet. It has a maximum weight capacity of 500 pounds. The tool mount will not mark or mar the material you are working on. This stand is completely foldable and is easy to store. It is possible though, that you may experience some issues with the lock especially if you take the miter saw off the stand quite often. Yet another rolling miter saw stand produced by Dewalt. This miter saw stand is made from aluminum and designed to be lightweight. Being lightweight allows for it to be easily moved from your jobsite and to your jobsite. Even though it weighs only 15 pounds, it has a maximum weight carrying capacity of a whopping 1000 pounds. With this stand, you can be sure that your toughest jobs are handled easily. The legs of the stand give maximum bracketing for the stand. The legs can also be folded to allow for quick and easy storage of the stand. You can transport two of this stand together because it has latches that are used in keeping them paired together. You may find, however, that these transport latches are not very practical. Read More: Best Motorcycle Wheel Chock Reviews & Buying Guides. This saw stand is three feet in height. With it, you do not have to bend over while working on your saw. You can work with more accuracy, precision and stability. 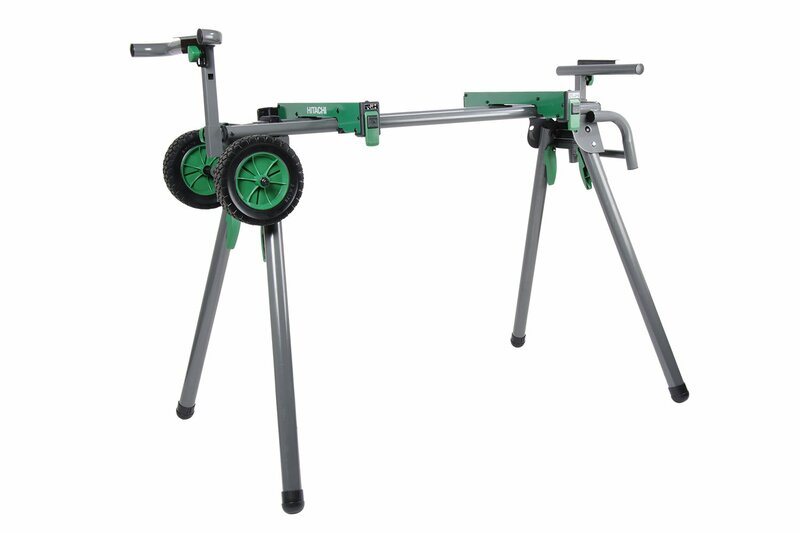 This saw stand will accommodate any up to 12-inch saws. It will even allow sliding compound saws. 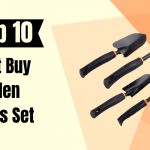 It is made with heavy-duty steel and powder coated to prevent rust. The legs of this stand sturdy and stable and are such that close with a snapping motion, so you can securely store them away. When no saw is mounted on it, it weighs 30 pounds and has a weight carrying capacity of 500 pounds. You can easily mount and dismount your saws and other extra tools. The downside of this stand is that it has been reported to have really bad welding. Dewalt seems to have the market cornered when it comes to miter saw stands. This miter saw stand has a universal and ergonomic design. Any brand of miter saw will fit perfectly in it. It is lightweight, weighs 30 pounds, is 3 feet high, is constructed with aluminum, supports 10 feet of materials and has a carrying capacity of 500 pounds. The design is compact allowing for easy use and subsequent storage. It has levers that lock down extensions firmly and securely. Your miter saw will easily be mounted on this stand because it also has mounting brackets. 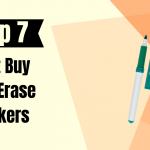 Your material will also not be marked or defaced while mounting. This stand, however, does not work very well with non-Dewalt saws. This rolling miter saw stand is 3-feet in height. It is constructed with heavy-duty steel and will support a maximum carrying weight capacity of up to 400 pounds. It will have a material extension that will extend up to 8 inches. It will accept miter saws up to 12 inches. It is really easy to put together, use and store away. You can easily mount your miter saw on this stand. After use, the mounting brackets also make it very easy to dismount your miter saw. The mounting brackets have ends that are covered in rubber so they do not scratch or damage the surface of your material. Some users have complained though, that sometimes, the rubber caps fall off; and that the miter stand has numerous performance defects. Read More: Best Jack Stands Reviews & Buying Guides. 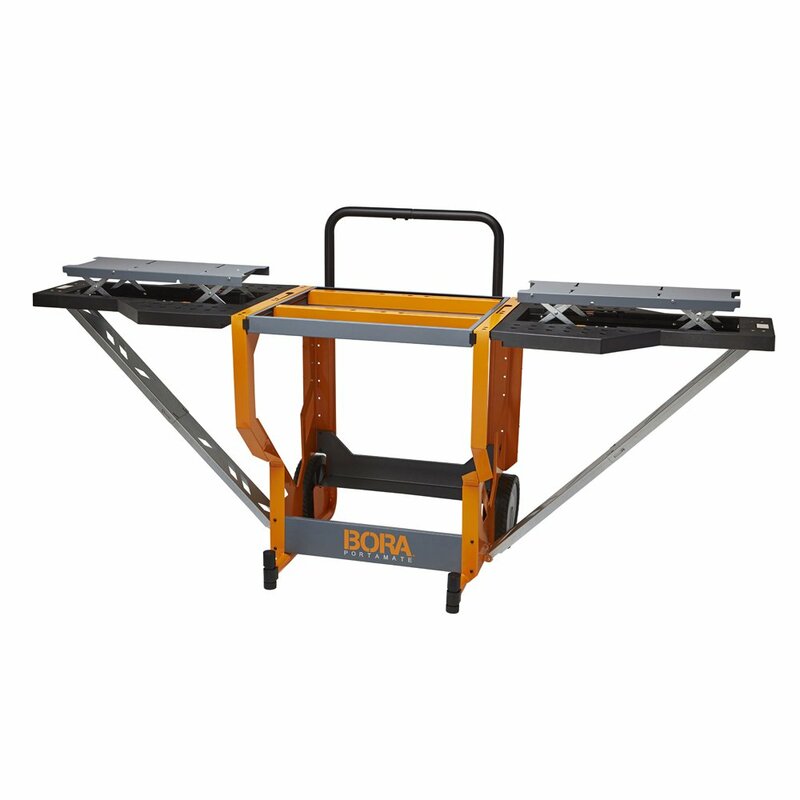 This rolling miter saw stand is constructed with lightweight, heavy-duty aluminum. It weighs only 15 pounds and has a weight carrying capacity of 1000 pounds. The design is ergonomic, user-friendly and is really easy to move around from worksite to worksite and also easy to put in storage. It is designed to be able to support the toughest jobs. The legs are foldable and provide optimum support for the stand. This stand allows for easy mounting and dismounting of your miter saw. The only disadvantage of this miter saw is that the legs tend to bend and splay out thereby affecting the balance of the stand. 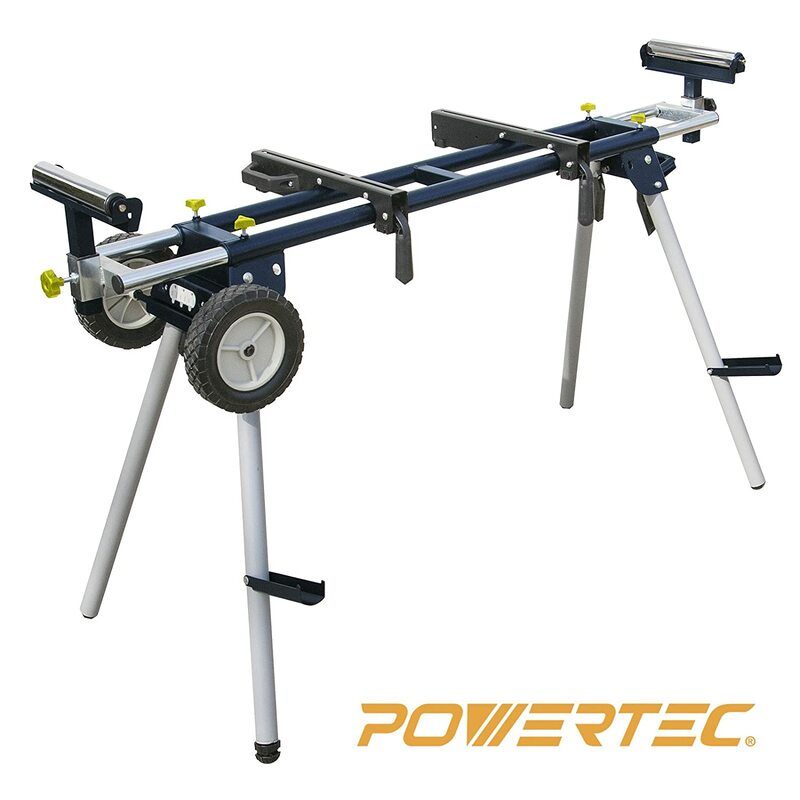 This rolling miter saw stand has a tubing of round steel construction. It features rubber wheels, each sized eight inches. 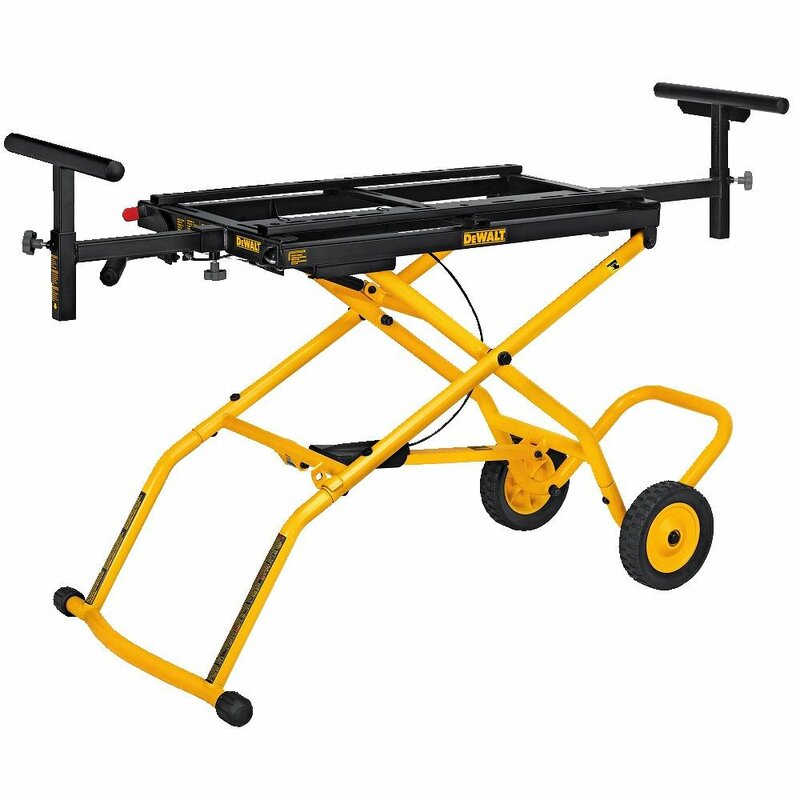 These wheels make it easy for the saw stand to be transported and moved around your jobsite. It allows for miter saws between 10 and 12 inches in size. It also has support arms that can extend up to 80 inches and retract up to 46 inches. The legs are locking and loaded with spring, which makes for effortless assembling and disassembling. It also has mounting brackets that will fit almost every other miter saws. It weighs 40 pounds and has a maximum weight carrying capacity of 330 pounds. You can use this stand even on uneven surfaces because the legs can be adjusted. The only disadvantage is that the legs tend to be unstable. 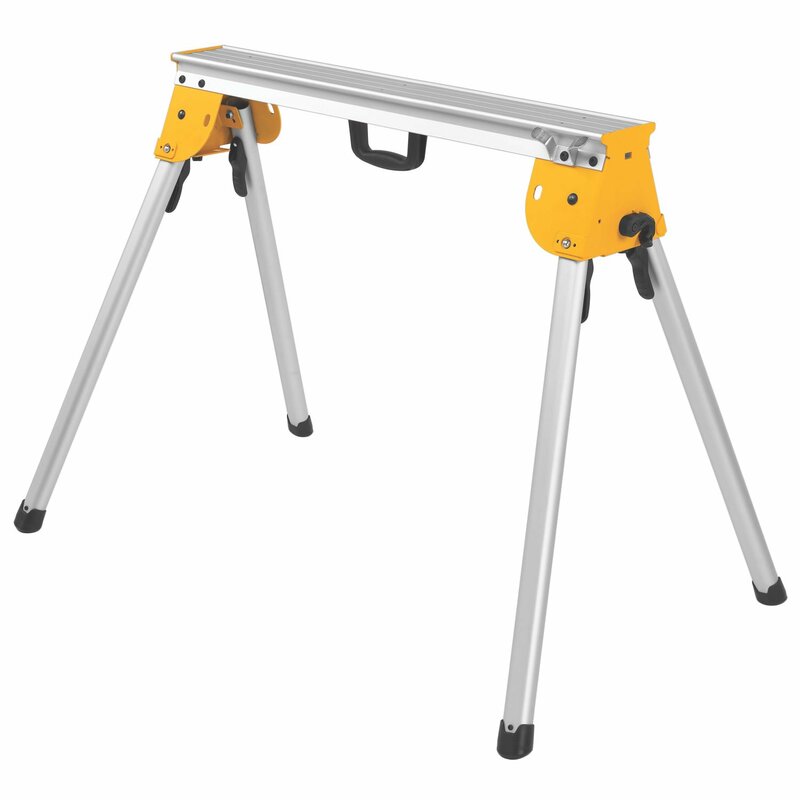 This rolling miter saw stand is made of durable, strong and sturdy steel. It is finished with a powder coating for additional protection and support. It can be easily transported, set-up, moved around, used, packed-up and stored for when it is no longer in use. The height of the stand can be adjusted to accommodate miter saws of various sizes for more accuracy and stability. It has a stop technology, locking casters and mounting braces. It weighs about 85 pounds and has a weight carrying capacity of about 500 pounds. The disadvantage of this miter stand is that the included instructions are not clear and are hardly explanatory. Read More: Best Car Ramps Reviews & Buying Guides. This rolling miter saw stand doubles as a workstation. The top of this stand can be flipped over when the saw is not mounted to serve as a normal work table top. Miter saws and other tools can be easily mounted on this miter saw stand. It can easily be folded to be moved and stored. The handle and wheels make it easy for this stand to be used and moved. The mainframe of the stand is solid, sturdy and durable. This stand is versatile, movable and can be rotated for convenience when it is in use. Any brand or size of miter saw will fit in properly in this stand. It has a weight carrying capacity of 500 pounds and has a one-year warranty. Compactness- If you intend for your miter saw to be moved around or used in multiple locations, the saw must be portable. Portable means it is lightweight, easy to move around and easy to store. Do not buy a miter saw stand that requires a tractor to move it. Flexibility- Miter saw stands are not custom-made. 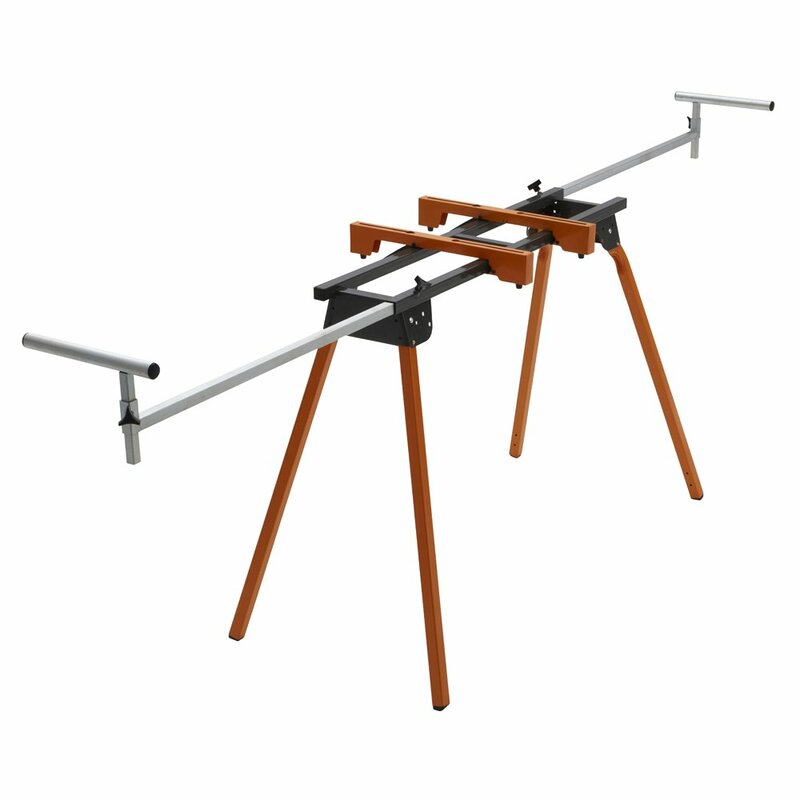 Miter saw stands should be compatible with a wide range of miter saws. 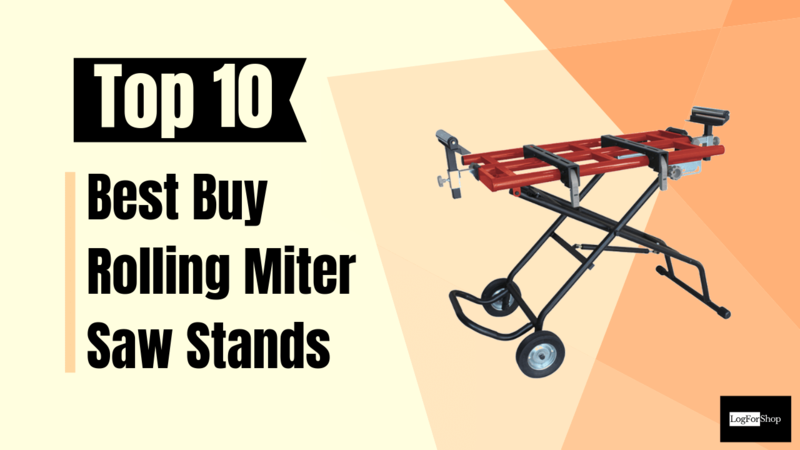 Buy a miter saw stand that will accommodate a variety of miter saws. 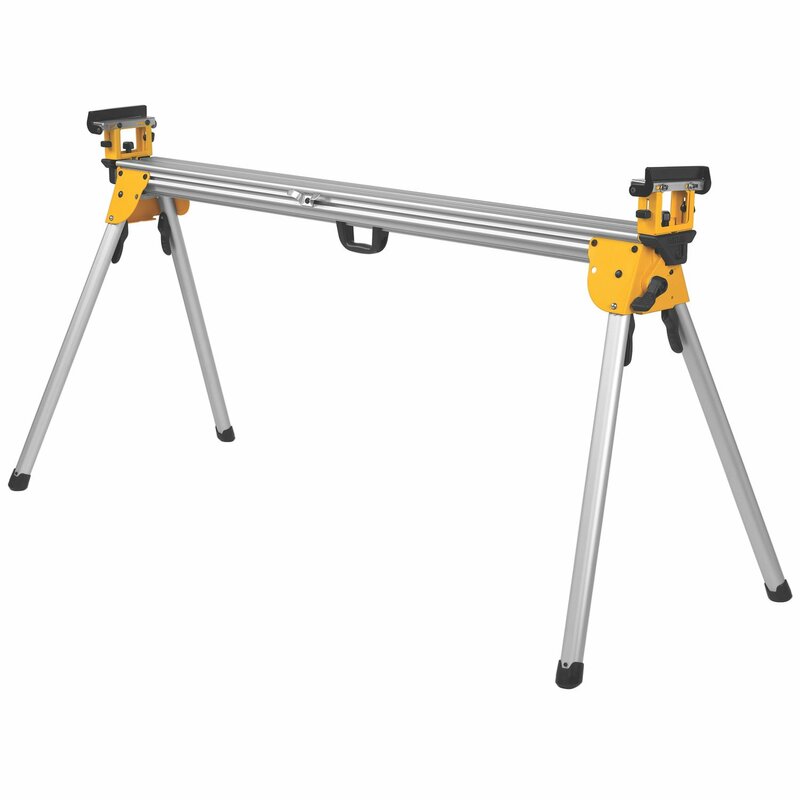 Dimensions- The miter saw stand that you buy must be such as will be able to support the weight of your miter saw and that of any materials that you may need to mount on the saw. In other words, buy miter saw stands that have a large weight carrying capacity. Anything from 500 to 1000 pounds will do. Stability- A non-stable mitre saw stand will do no you good. It will affect the accuracy and precision of your cuts. Buy stands that will maintain stability even on the rough or non-level ground. Some of the other factors that you should consider include ease of use, durability, strength, and more importantly budget. A good miter saw stands will impact your work positively and give your cuts that extra look of precision and professionalism. Do be careful with both miter saw stands and the miter saws themselves though. Exercise and observe safety rules. Be sure that miter saws stop running before lifting them off your material. Professionalism in work outlook is great, but your safety takes higher priority.